The oldest traces of the Frisian population (proto-Frisians) in the Low Countries date back to the end of the Bronze Age in 700 BC, which makes the Frisians one of the oldest still-surviving tribes in Europe. Their origin circa 1000 BC probably lies in southern Scandinavia, along with the other Germanic peoples. The coastal area around Friesland (Zwin, near Sluis in Zeeuws-Vlaanderen, and Weser, Bremen) was initially ruled after the collapse of the Roman empire by local Frisian leaders. During this turmoil smaller tribes in the Low Countries, like the Canninifates and the Batavi, merged with the bigger tribe of the Frisians, while some communities joined the Jutish/Saxon migration to southern Britain. This region comprised the coastal area around the upper Netherlands, eastwards to the mouth of the Weser. The western half, which became known as West Frisia, emerged as a distinct region during the feuds of the thirteenth century AD, and evolved into the modern Netherlands. The remainder was then distinguished as East Frisia and was essentially German in character. The list is legendary until the advent of the Roman empire (names backed in lilac). Before Charlemagne's rule, it remains uncertain. It was from this coastal strip that the combined Saxon and Frisian settlers headed for the southern shores of Britain in the fifth and sixth centuries. The language of the remaining population is still very closely linked to modern English. Traditional founder of the Frisian Commonwealth. After Frana, the authority of the folk mothers collapses. A period of division follows, with no clear Frisian rulers apparent. Eventually ruled jointly with the first king of Frisia. The Frisii of the first centuries BC and AD formed a relatively large Germanic tribe, one that was comparable to the Chauci in number. By this time they were located on the coastal areas of the modern Netherlands, between the lower Rhine and the modern German border. To the south were the Batavi and Canninefates, to the east were the Chamavi, while the Campsiani and Chauci lay to the north, along the coastline. The Frisians were noted by Procopius as the Frissones. A large-scale incursion of the sea into Jutland around the period between 120-114 BC is known as the Cimbrian Flood. It permanently alters the shape of the coastline and drastically affects the way people live in the region. It is probably this event which affects the Teutones (Teutons) and Cimbri. These two peoples migrate en mass from their homeland, heading southwards towards Italy. Along the way they pick up the Celto-Germanic Helvetii peoples (in territory that later becomes Franconia), and possibly spark a secondary migration of Belgic peoples from the Netherlands and northern Gaul into south-eastern Britain. Folk Mother appointed by Adel IV. Nero Claudius Drusus Germanicus, stepson of Emperor Augustus, is appointed governor of the Rhine region of Gaul. He launches the first major Roman campaigns across the Rhine and begins the conquest of Germania. He starts with a successful campaign that subjugates the Sicambri. Later in the same year he leads a naval expedition along the North Sea coast, conquering the Batavi and the Frisii, and defeating the Chauci near the mouth of the Weser. Luckily for them, the receding tide traps his vessels and he is forced to withdraw and avoid further conflict. In 11 BC, he conquers the Bructeri, Usipetes and Marsi, extending Roman control into the Upper Weser. In 10 BC, he launches a campaign against the Chatti and the resurgent Sicambri, subjugating both. The following year he conquers the Mattiaci, while also defeating the Marcomanni and Cherusci, the latter being taken care of near the Elbe. He is killed in a fall from his horse during his fourth campaign, and his death deprives Rome of one its best generals. The Frisii on the Lower Rhine are driven to revolt against the Roman empire by excessively zealous tax collection. The Chauci and Frisii are to be found under the command of Gannascus of the Canninefates. Together, they raid the coastline of Gallia Belgica, although the Chauci have been doing this for some years already. The Chauci also penetrate territory in Gallia Belgica that in 80-83 is reformed into the Roman province of Germania Inferior (it now forms parts of the southern Netherlands). The newly-appointed Roman military commander, Corbulo, engages the attackers in battle and defeats them. He also places triremes on the Rhine and takes on the Chauci vessels, successfully destroying those too. Gannascus is driven out of Gallia Belgica and the Frisii are occupied by force and classified a client state. Under the pretence of holding negotiations with Gannascus, the Romans assassinate him. This dishonourable act causes outrage among the Chauci, and Emperor Claudius orders a withdrawal of Roman forces to the Rhine in order to ease tensions. Frisia is re-classified as an allied state of the Roman empire. It is around this time that the Chauci tribe expand westwards as far as the River Ems. To achieve this expansion they expel the neighbouring tribe of the Ampsivarii and subsequently find themselves bordered to the west by the Frisii. During this period, as noted by Tacitus, the Frisians were already located to the west of the Zuyder Zee, making them the most westerly of the Germanic peoples of the north of Europe, occupying parts certainly not originally Germanic in speech. The Batavi were located to their south. Tacitus indicates a division of them which probably also integrated Celtic peoples as the Lesser Frisians, west of the navigable lakes, while the main body of the people remained the Greater Frisians, free from Roman control in the still little-known or explored marshes and fens to the north and east, lands into which the Romans scarcely ever ventured. Pliny the Elder has the little-known Sinuci tribe of Belgae living between the Frisavones and the Tungri (remembering that the Tungri have been settled on the former territory of the Eburones for the past century). The Frisavones (Frisævones or Frisiabones) would appear at first sight to be a division of the main body of Frisii. Pliny appears to differentiate between the two, with the Frisavones settled to the south of the Frisii, and seemingly very close to the Batavi. This location makes it usual to equate the Frisavones with the Lesser Frisians of the subsequent Offo period of Frisian history. The lower Rhine has recently been cleared out by Rome to serve as a buffer zone between the empire and tribal Germania. The Frisii are under the mistaken belief that they will be exempt from any retaliation by Rome if they reoccupy this area. They begin to cultivate the land but Rome demands that they vacate it immediately, They send two princes, Malorix and Verritus, to Rome to plead their case, and when he finally sees them, Emperor Nero grants them Roman citizenship, but does not grant their request to keep the land. In the end it takes the arrival of a Roman cavalry expedition to sweep them out. Then the homeless Ampsivarii tribe petitions Rome to be able to settle the area but this attempt also fails. Gaius Julius Civilis leads a Batavian insurrection against a Rome which is distracted by the events of the Year of the Four Emperors. Supported by the Bructeri, Canninefates, and Chauci, while the Sinuci are also mentioned as a people who live in the region (although their involvement in the revolt is uncertain). The tribes send reinforcements, and Civilis is initially successful, with Castra Vetera being captured and two Roman legions being lost. But to illustrate the dual nature of Chauci policy towards Rome, both they and the Frisii have auxiliaries who are serving with the Romans. A cohort of these are trapped and burned at Colonia Claudia Ara Agrippinensis (modern Cologne). Eventual Roman pressure, with aid from the Mediomatrici, Sequani, and Tungri, forces Civilis to retreat to the Batavian island where he agrees peace terms with General Quintus Petilius Cerialis. It is around this period that the little-known Sinuci are mentioned by Pliny the Elder and Tacitus. Pliny places them between the Frisavones and the Tungri (remembering that the Tungri have been settled on the former territory of the Eburones for the past century). The Frisavones receive two mentions by Pliny and one by Tacitus, and they are usually equated to the Lesser Frisians of the subsequent Offo period of Frisian history. In his work on Greater Germania, the Roman writer Tacitus locates the Frisians to the west of the Zuyder Zee (in the modern northern Netherlands and north-western Germany), with early groups of Saxons on their eastern flank, along with the Chauci. To the south-east are the Chamavi and Bructeri, to the south the Batavi and the little-known Canninefates, while to the north-east, across the Elbe, are the Aviones and Reudigni. The Frisians of this period were bordered to the north-east by the Saxon tribes and to the south by the Franks. 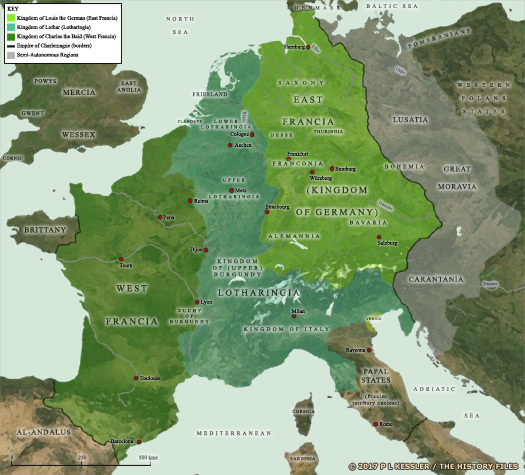 Both Frisians and Saxons began forming their own states around this time, while Roman forces were shrinking away from their southernmost territories into the domain of Soissons. 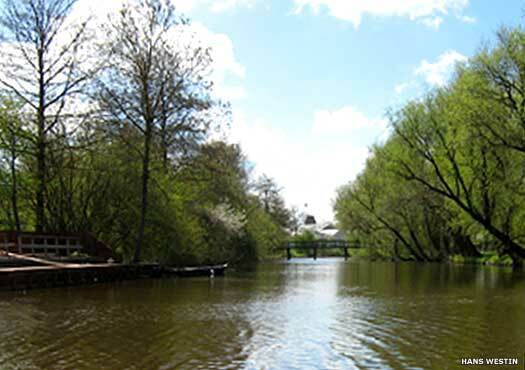 The Romans knew of the Frisians through their fisheries near Leeuwarden, and there were Frisians in the Roman army, some of whom were stationed in Britain. Something of Tacitus' division of the Frisians noted above probably remained in the heroic age of the fifth century (noted in Beowulf and Widsith). The Greater Frisians (Fresena cyn or 'kin', Frysna hwylc or 'folk', Frysland, Fresnaland, and many such variants) formed the main mass of the peoples who were governed (at least nominally) by the kings of Frisia. The Lesser Frisians had by now joined with the Hetware (Hætwere) and the Franks to the south, while the Chamavi who were part of the Frankish confederation were settled to the east of the coastal Frisians. These Lesser Frisians may be the Frisavones of the previous Ubbo period of Frisian history. The Frisians in general seem to have been a major sea power in the region, perhaps even the dominant power, helped by the fading of 'Saxon' piracy as the migration to Britain got underway in the fifth to early seventh centuries, accompanied by Frisians in some numbers. Frisian wealth through trading quickly grew during the sixth and seventh centuries, leaving it in a very powerful position. The Franks united in this century to form a vast kingdom on the southern borders of Frisian territory, a cause of eventual grief for the Frisian tribes. In the north, an even more imminent threat was the growing dominance of the Scandinavians, especially the Danes. The Dene, or Danes, migrate during this period from southern Sweden into Jutland and the Cimbric Peninsula, putting the Jutes under increasing pressure in the competition for living space, and forcing them south and westwards. In this period the Jutes are often closely associated with the Frisians, possibly because many Jutes appear to leave their homeland in this difficult time to seek employment or settlement elsewhere, most notably with the Frisian royal household (where they are present on both sides in the conflict of c.448). The latter name is in the genealogy of Angeln as Finn's father. Son. Added to the royal genealogy of Angeln. Hnæf of the Danes is killed at the 'Fight at Finnesburg' in Frisia, as is Finn's eldest son. Finn (who is also mentioned in the Old English epic poem, Widsith) is subsequently killed by Hnæf's Anglian comrade in arms, Hengest (Hengist), presumably the great-grandson of Wehta. Hildeburh, the Danish wife of the dead Frisian king, is returned to her people. Finnes ham is sacked. While Finn's eldest son is killed in the tragedy of the Freswæl (the traditional name of the Finnesburg event, meaning 'the Frisian Slaughter'), it seems probable that there is a second son who survives and escapes the sack of Finnes ham to lay claim to Frisian rule. It seems likely that both sons are remembered in later English royal genealogies, along with Finn who is clearly present in those genealogies as an heroic name who is suitable to claim as an ancestor. His sons would have been arranged in series after Finn, in the manner of genealogies, becoming genealogically son and grandson of Finn. If this is the case, then the names of Finn's sons can be extracted from the genealogies as shown here. Frealaf especially is shown in all versions of the royal genealogies. Son and heir. Born c.433. Killed in the Freswæl c.448. Brother. Probable survivor of the Freswæl, and Frisian king. Hengist (if this is the same man as at the Freswæl) leads his people to Britain, initially to serve as a mercenary there, but this quickly turns into the conquest of a kingdom in Kent. It seems that he invites large numbers of Frisians with him, which would account for archaeological findings in Kent which originate from the mouth of the Rhine. It is possible that this partial Frisian exodus is spurred on by the strategic western European victory at the Battle of Chalons in 451 which allows for a sudden rise in Frankish dominance in the region, probably to the detriment of the Frisians to their north. The Frisians probably include the large numbers of Jutes who had been in Finn's service - perhaps all of them. The Germanic Chattuarii appear to be named in two epic Old English epic poems, Beowulf and Widsith, as the Hætwerum (Hetwaras). This tribe forms a coalition with the Frisians and the Hugas (perhaps the Chauci) to fight a Geatish raiding party led by Hygelac, king of the Geats. Hygelac is killed, his party heavily defeated, and only Beowulf escapes. The English Bishop Wilfred arrives in Frisia and the Anglo-Saxon Christianisation of the Germanic lands begins, although the first mission is quickly aborted as the fiercely pagan Redbad gains the throne and enmity against the Merovingian kings increases. Fought Franks for entire reign. Regained independence in 718. Friesland is conquered by the Frankish Merovingian kingdom, although Redbad continues to resist until his death. The Franks partition the area into three regions: Eastern Friesland (between the rivers Lauwers and Weser - later part of Germany); Middle Friesland (between Vlie and Lauwers); and West Friesland (everything west of the Vlie (the important sea arm, essentially for trading places like Dorestad) - the modern Netherlands). In 718-719, Frankish civil war allows the Frisians to declare their independence. Bishop Wilfred of England returns to Frisia and proves much more successful. For the best part of a century churchmen and monks crisscross the Channel or North Sea, intent on spreading the Christian faith amongst their Germanic cousins who border the Merovingian Frankish kingdom. There is special interest in the conversion of the German Saxons, whom the English consider their kinsfolk. 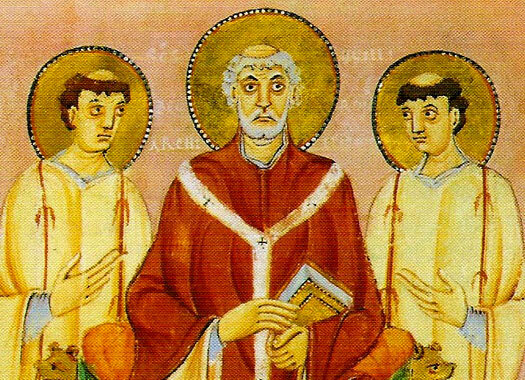 Pope Sergius ordains Bishop Willibrord as the bishop of the Frisians. The bishop is a Northumbrian missionary and a follower of Bishop Wilfred, one of a wave of English Christians to enter Germanic lands in this period in order to bring them into the faith. Willibrord becomes the first bishop of Utrecht, a fortress which is given as the bishop's palace. An old church within the walls of the former Roman fort becomes his cathedral, an event which is regarded as the founding point of the modern city of Utrecht. Bishop Willibrord is given land by the Merovingian mayor of the palace, Pepin II of Herstal, at Echternach, at which he founds a monastery to act as his new base. He is ultimately buried there, in the tenth century crypt of the church that bears his name. The territory is within the Frankish empire, but it ultimately forms part of the county of Luxemburg. The death of the powerful mayor of the Merovingian palace, Pepin II, is the signal for bitter internecine warfare between his grandsons, their sponsors, and his illegitimate son, Charles Martel. Redbad seizes his chance and ravages the Christian enclaves which have been imposed on Frisia by the Franks and drives Willibrord from the country. The bishop retires to Echternach. Charles Martel proclaims Chlothar king of Austrasia, dividing the Merovingian empire for the first time since 691. During the civil war that follows, the Frisians are able to declare their independence under Redbad, but his death in 719 allows a more cooperative king to gain the throne, and Willibrord is allowed to return to continue his missionary work. The Merovingian empire retakes full control of the Frisians. The final two kings are either puppets or Merovingian administrators. The Saxons have secured help from the Frisians during the Saxon Wars against the Carolingian Franks, but even so Charlemagne drives Widukind and his forces back into the heartland of their territory. Widukind and his colleague or co-leader, Abo. are forced into a surrender in return for clemency and they accept Christianity. The East Francian section of the empire inherits Frisia. Frisia remains officially attached to Germany until the Peace of Westphalia in 1648. The ruling house is demoted to the rank of count. The Frisians suffered heavily from Viking, especially Danish Viking, attacks during the period in which England was also facing destruction and eclipse by the sheer weight of Viking attacks. There, only Wessex survived as an independent kingdom. In Frisia, independence had already been lost to the East Franks, but now Frisian dominance of the local coastal area, the Mare Fresicum, was destroyed by repeated Viking attacks. Dorostates Frisionum, the chief trading town from at least as early as the sixth century, known as Dorestad in the ninth century (modern Wijk bi Duurstede not far from Utrecht on the Lower Rhine), suffered especially. Alfred the Great of Wessex experiments with warship styles for his navy. The two styles of choice are Frisian or Danish, revealing the importance of both peoples in the building of state-of-the-art warships. It seems that Frisian masters and crew make up a sizable proportion of the manpower of this new royal navy. Nine ships are involved in a not entirely successful skirmish in which three of the five officers who are important enough to be named are Frisians. Sixty-two of Alfred's navy are killed, Frisians and English (noted in that order). The Frisians and English are still one people separated only by an ocean, and speaking the same language with only dialectal differences (in the same way that the Britons of Brittany maintain close relations with the Cornish of England until early modern times). The counts of West-Frisia ruled locally in the name of the archbishop of Utrecht, who himself governed the area on behalf of the Holy Roman Emperor. 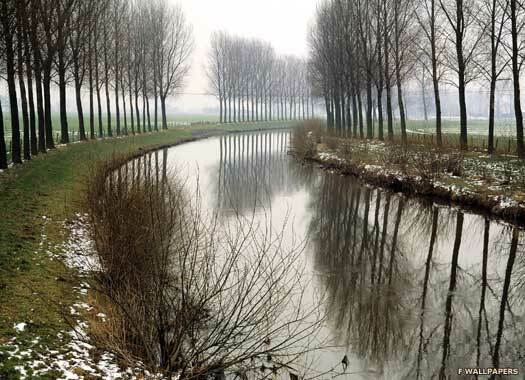 Frisia consisted at this time of the whole coastal area from Flanders to the Danish border, including Utrecht. Count Dirk's territory corresponds roughly with the present day provinces of South and North Holland. m Hildegard of Flanders. First Count of West-Frisia (964). When Floris I dies, his widow, Gertrude, initially governs West-Frisia as regent, until Dirk V can accede to the title of count of Holland. The name 'Holland' only came in use around the year 1100. Before that the region was recognised universally as Western Frisia. Son of Floris I of West-Frisia & Gertrude of Saxony. Countess / Gravin. Wife of Floris I. m Robert of Flanders. m Gertrude. Count of Flanders (1071-1093). The old line of counts had by now become extinct, and internecine feuding erupts, and continues until the region is invaded by Spanish imperial troops at the end of the fifteenth century. Son. Rival for the Holy Roman empire (1247-1256). The separation of East Frisia from West Frisia had been de facto during the internecine feuding of the thirteenth century. The division becomes permanent when the Dollart Estuary, at the mouth of the Elms, is flooded. A line of independent counts is established there by 1400. Floris is murdered, and his son, Jan, may be involved. If so, it is something he regrets as, according to local legend, he orders the building of Heilig Lambertuskerk in Linden, to the south of Nijmegen, as a penance. Aleid, younger sister of William II, marries Jan of Avesnes, count of Hainaut, in 1246. Their son becomes Jan II of Holland. Count of Hennegau (1280). Grandson of Margaret I of Flanders. Countess / Gravin. Dau of William III. m Louis IV the Bavarian. William, son of Margaret and Louis IV of Bavaria, becomes William V of Holland. Hennegau ceases to be used in the title. The Beiers ruled in West Frisia only. An independent line of counts became established in East Frisia which had been divided from the west since the flooding of the Dollart Estuary in 1277, and the region eventually became part of Germany. Son. m Margaret of Burgundy (1385). Countess / Gravin. Dau. No heir. d.1436. John IV, Duke of Brabant (1415-1427). m Jacoba. With the remarriage of Jacoba to the English Henry of Gloucester, the title passes to the dukes of Burgundy. Philip gains the duchy of Luxembourg, a key link in the chain of possessions between Burgundy and Flanders and a vital component in raising Burgundy's wealth and power. Duke René of Lorraine is facing increasing pressure both from Louis XI of France and Charles the Bold of Burgundy. He has already allied himself with Charles, but Burgundian garrisons have been established in Lorraine so René now switches allegiance to Louis. Charles invades Lorraine, forcing René to abandon Nancy on 30 November 1475. The city is recaptured on 5 October 1476 before René leads an army of Swiss mercenaries into the Battle of Nancy on 5 January 1477. Charles is defeated and killed, ending the Burgundian Wars. Duchess of Burgundy. m Maximilian of Austria 1477. The duchy of Burgundy reverts to the French throne through the efforts of Louis XI of France. The Free County of Burgundy and Flanders pass to Austria, along with the county of Holland, creating a very different feel for the Low Countries. In 1493, with the accession of Maximilian, they become possessions of the Holy Roman empire. Became HRE Emperor (1493). Passed Holland to his son. The county of Holland passes to the son of Holy Roman Emperor Maximilian and Mary of Burgundy. That son is Philip, later king consort of Castile. The following year, an alliance is formed between Naples, the Pope, Milan, Venice, and the emperor in order to defend Italy from Charles VIII of France. 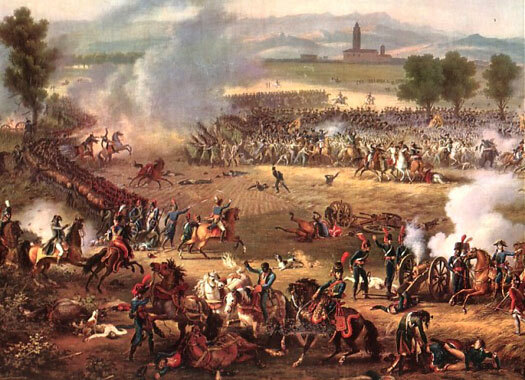 This marks the beginning of the highly destructive Italian Wars which last until 1559. Became King Philip I of Castile (1504). Regent for Charles II. HRE (1493-1519). Grandson of Maximilian. Charles I of Spain (1516-1556). Philip II of Spain (1556-1598). Deposed by the Dutch. While the Habsburgs rule Holland from Spain, the House of Orange rises to prominence in Holland itself as stadhouders (viceroys), holding the title of prince. The absent Habsburgs are eventually thrown out during a Dutch revolt known as the Eighty Years War (1568-1648). Dau. m Hendrik III of Nassau (1515). Count of Nassau. Prince of Orange. Son. Count of Nassau. Prince of Orange. Nephew. Count of Nassau. Prince of Orange. The princes of Orange play no part in Dutch history until this year. William I, count of Nassau, prince of Orange (born in Nassau), is officially proclaimed stadhouder of the counties of Holland and Zeeland and the diocese of Utrecht by Charles V, Holy Roman Emperor. The princes of Orange now rule in the name of the absent Spanish count of Holland, Philip III (King Phillip II of Spain). Led revolt against Spanish Habsburgs. Assassinated 10 July. The War of Liberation (or Eighty Years War) against the Spanish Habsburgs ends with the Münster (Westphalia) peace treaty. Europe recognises the independence of the Netherlands. The Habsburgs are thrown out of the Netherlands. William, who remains stadhouder, now governs Holland along with the Staten Generaal (the representatives of the seven provinces). The Netherlands is officially declared a republic. The Staten-Generaal continues to select members of the House of Orange to govern the Netherlands as stadhouder (even though there is no longer any monarch). They are kings in all but name. The city of Nijmegen is conquered by the Dutch stadhouder, freeing it from Habsburg control. Its predominantly Catholic churches are immediately converted to Protestantism. A Dutch admiral, William Jansz, discovers a landmass in the southern ocean which is eventually named Australia, but no effort is made to colonise it. A few years later Abel Tasman and the Dutch navigator, Visscher, find Tasmania and New Zealand in their search for a commercial route to South America, but very little detail of their voyage is known until the British Captain Cook makes three great voyages from 1768 to chart the entire region. The Spanish Netherlands is exhausted by the war with the northerners. A truce is agreed which all but recognises the legality of the independence of the northern Netherlands. The Dutch found a commercial trading post on the eastern coast of North America and name it New Amsterdam. Dutch pirates freely operate against the Spanish in the Americas, especially in the vicinity of Hispaniola. The first director-general of the Dutch West India Company's colony of New Netherland in the Americas is appointed in 1624. The following year, Dutch forces under Boudewijn Hendrick attack the capital of Puerto Rico, but are forced back by the governor, although they set fire to the city as they retreat. The First Genoese-Savoyard War is part of the greater Thirty Years' War (1618-1648). Savoyard forces join those of France and the Netherlands to besiege Genoa, the capital of the eponymous republic, while the rest of its lands suffer occupation by the invaders. Spain sends a major naval expedition to relieve Genoa, which it does. The Genoese republic is restored and they and the Spanish turn the tables, invading Piedmont and securing the overland supply route between northern Italy and the Spanish Netherlands, known as the Spanish Road. The war ends in a stalemate with the Treaty of Monçon. A new director-general arrives at New Amsterdam to take command of the New Netherland settlements - Governor Kieft - who chooses to deal with the neighbouring tribes through intimidation rather than negotiation. One of his first actions is to send an armed sloop to the Tappan villages to demand a tribute of corn and wampum. The Tappan have always been peaceful and have even sold some of their land to the Dutch. They reluctantly pay but cannot believe that the Dutch have treated them this way. The Dutch become allied to the African Kongo kingdom as the latter attempt to dislodge the Portuguese slave traders. Eerste Stadhouderloze Tijdperk (the First Stadhouderless Era). William III is born eight days after his father's death. As William III is too young to rule, and there is no other Orange to select, the Staten-Generaal do not select a stadhouder at all. The colony of New Sweden in the Americas has its main settlement at Fort Christina captured by the Dutch in retaliation for a brief Swedish occupation of one of the forts in New Netherland. Under the leadership of the duke of York, the English attack and capture the province of New Netherland in 1664. 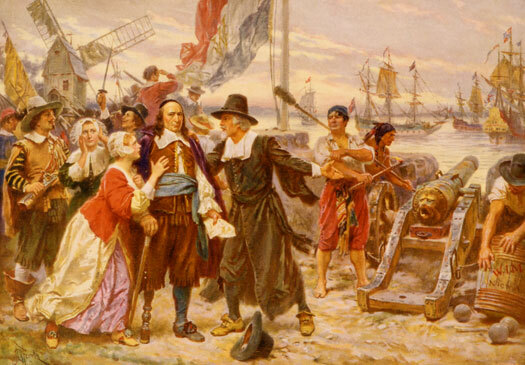 The act leads to the Second Anglo-Dutch War the following year, which ends with the Netherlands agreeing to the English ownership of the colony in exchange for Suriname. Several nations declare war on the Netherlands and the people plead for a member of the house of Orange to lead them. William III is selected. Son. William III of England (1689-1702). No heir. The territory of former Dutch New Amsterdam is seized during the Third Anglo-Dutch war, but is returned to England as part of the Treaty of Westminster in 1674. It is during this period, the last quarter of the seventeenth century, that the Netherlands takes control of the islands which form the Dutch West Indies. Mostly discovered and partially settled by Spain in 1493 (the windward isles) and 1499 (the leeward isles), their conquest by the Dutch West India Company secures them as military outposts and trade bases. This is the Tweede Stadhouderloze Tijdperk (the Second Stadhouderless Era). No stadhouder is elected by the Staten-Generaal until 1747. This is true even during the War of the Quadruple Alliance, when King Philip V of Spain, unhappy with the arrangements set at the end of the War of Succession, occupies Sardinia and Sicily. The war begins with Philip's first actions of 1717, and is formally declared in 1718. Austria, Britain, France, and Holland unite to defeat Spain, and peace is again declared with the Treaty of The Hague which is signed in 1720. Hessen-Homburg's minimal finances remain perilous, and the landgraviate's debt has continued to grow. Landgrave Frederick III is forced by an imperial debit commission to return to the service of the Dutch in 1738. He is made governor of the Belgian city of Liege in that year, being promoted to Breda in 1741 until his death in 1746. The French invade the Netherlands, and the Staten-Generaal popularly elects a member of the House of Orange to lead the country's defence. A remote cousin of William III, William of Nassau (formerly Nassau-Dillenberg), stadhouder of Friesland, is chosen to fill the post. In honour of his predecessors he assumes the name 'Orange-Nassau'. The Tweede Stadhouderloze Tijdperk (the Second Stadhouderless Era) was triggered by the death of William III in England in 1702. He died without an heir and no stadhouder was elected in the Netherlands by the Staten-Generaal to succeed him. In 1747, the French invaded and again, the Staten-Generaal popularly elected an Orange to lead the country. A remote cousin of William III's, William of Nassau (formerly Nassau-Dillenberg), stadhouder of Friesland, was elected to the post. In honour of his predecessors he took the name 'Orange-Nassau' (the principality of Orange had been returned to France with the Treaties of Utrecht in 1713, but the title had stayed with the Dutch). The elected title of stadhouder was changed to erfstadhouder (hereditary stadhouder: 'erf' or 'erven' which means 'inherit'). The Netherlands remained a republic until the French conquest of 1795. Stadhouder of Friesland (now one of the seven provinces). Declared war on France (1793). Fled to England (1795). The French Directory is established on 3 November 1795, headed by Paul Barras. France's Revolutionary Wars against the monarchies of Europe begins to carve out a new empire for the country, both at home and abroad, where the entire island of Hispaniola is gained from Spain in 1795. Now, only a year after joining the First Coalition, the Netherlands is invaded and the puppet Batavian Republic set up (Baatafsche Republiek, named after an ancient Germanic tribe called the Batavi), which is modelled on the French system. Subsequently a peace agreement is sealed with Prussia and Spain. Hessen-Homburg falls under near-constant French military occupation, having to pay contributions to the French war effort. 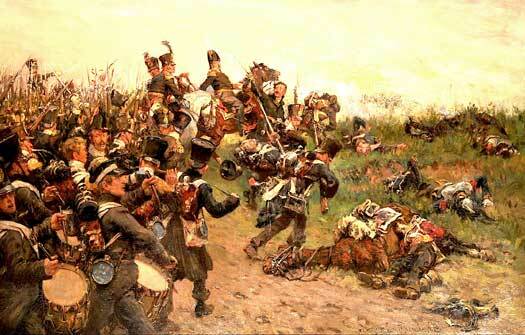 On 14 June, the Second Coalition is effectively destroyed by an Austrian defeat at the Battle of Marengo. The French victory re-secures their client republics in the Netherlands and Italy, although Napoleon has already restored the Cisalpine republic, on 4 June. The French-controlled kingdom of Holland is created by Napoleon Bonaparte. The French-controlled Kingdom of Holland was created by Napoleon Bonaparte as he extended his new model of controlling his captured territories. He placed one of his brothers on the throne. Napoleon throws his brother out of office and draws Holland directly into the French empire. Napoleon is forced out of Germany and greatly weakened in Holland. William I raises Dutch forces as part of the British-led Allied Army. The modern kingdom includes territory that in the first century AD was occupied by various Celtic and Germanic tribes including the Batavi and Canninefates. They were eventually subsumed either by the Franks to the south or the Frisii to the north. The Netherlands also includes parts of former Lower Lorraine which was made up of Breda, Antwerp, Brabant, and Aix-la-Chapelle. This had passed to the dukes of Brabant in 1100 and the title of Lower Lorraine had fallen out of use in 1190. Son of Prince William V. Sovereign of Holland 1813-1815. The duke of Wellington's Anglo-Dutch-German army defeats Napoleon's French army at the Battle of Waterloo on 18 June in conjunction with the Prussian army, ending twenty-five years of war in Europe. By the power of the subsequent Congress of Vienna, William is elevated to the status of king to rule the United Kingdom of the Netherlands, incorporating Holland and Belgium. He is also made grand duke of Luxembourg. Belgium splits from Dutch rule and the following year proclaims its own kingdom. The country shortens its name to 'Kingdom of the Netherlands', although the king remains monarch of Luxembourg. In 1839 he also becomes duke of Limberg. William abdicates and three years later dies in Berlin. The title 'Duke of Limberg' passes to his son along with the Dutch throne. Son. Nicknamed Little Frog by British in the Peninsula War. In a year of European revolutions, the citizens of France revolt against their government and the monarchy is overthrown. William II heads off potential revolt in the Netherlands by instituting a more liberal regime. A committee headed by a prominent liberal, Johan Rudolf Thorbecke, is selected to create a new constitution, which allows for the Eerste Kamer (the Dutch Senate) to be filled by indirect election through the Provincial States. The Tweede Kamer (the House of Representatives) is to be elected directly, although only through census suffrage rather than universal suffrage (until 1917). By instituting these changes, the king greatly decreases royal power. Son. His own sons predeceased him. In what is known as 'The Luxembourg Coup of 1856', William III revises Luxembourg's constitution on 27 November. Probably as a reaction to the loss of authority in the Netherlands, William greatly expands his powers. The announcement of the changes is made by Prince Henry, governor of Luxembourg. British influence over the Gold Coast increases further when Elmina Castle is purchased, this being the last of the Dutch forts along the coast. The Asante, who for years have considered the Dutch at Elmina to be their allies, now lose their last trade outlet to the sea. To prevent this loss and to ensure that their revenue stream continues, an invasion of the coast is planned for the following year. William III has no surviving male heirs, so his daughter Wilhelmina becomes queen of the Netherlands. Under Salic Law, the grand duchy of Luxembourg cannot be ruled by a woman, so the position of duke is granted to a distant relative of William III. This ends the personal union between the Netherlands and Luxembourg, but it grants a ducal seat to Adolphe, the dispossessed duke of Nassau. Dau. Queen. m Prince Henry of Mecklenburg-Schwerin. In the first full year of the Second World War, Wilhelmina and the Dutch Government flee to London to escape the Nazi German army as it makes a lighting strike on the Netherlands and Belgium, and proclaim a Dutch Government in Exile. Following its release from renewed German occupation during the Second World War, Luxembourg abandons its neutrality and becomes a front-rank enthusiast for international co-operation. In 1948 Luxembourg furthers its attempts to encourage a more unified Europe by becoming a founder member of a customs union with Belgium and the Netherlands. Wilhelmina abdicates to make way for her daughter, Juliana. 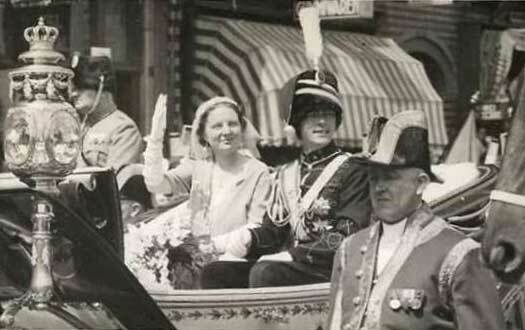 With the latter having married Prince Bernhard of Lippe-Biesterfeld in 1937, their children are technically members of the House of Lippe, but officially they remain part of the House of Orange-Nassau. Dau. Queen. m Prince Bernhard of Lippe-Biesterfeld. Abdicated. Juliana becomes known as the Bicycling Queen, due to her fondness for cycling alone in public in the days before heavy personal security. Juliana abdicates in 1980 in favour of her daughter and remains Princess Juliana until her death on 19 March 2004 from pneumonia. The Dutch West Indies become the semi-autonomous Netherlands Antilles. Aruba also remains a possession. The Dutch colony of Suriname in South America gains independence as a republic. Dau. Queen. m Claus von Amsberg. Abdicated. The queen's second son, Prince Johan Friso, gives up his rights to the throne when he marries human rights activist Mabel Wisse Smit. The government had refused to give its support to the marriage, because the couple had given misleading information about the bride's relationship with a dead gangster. Under Dutch law, royals who aspire to the throne must receive permission from the government and parliament to marry as the cabinet will bear responsibility for their actions. The Netherlands Antilles ceases to exist with a change of the five islands' constitutional status. Curacao and St Maarten become autonomous countries within the kingdom of the Netherlands, joining Aruba (which had gained the status in 1986). Bonaire, St Eustatius and Saba become autonomous special municipalities of the kingdom. The Netherlands retains responsibility for defence and foreign policy. The Dutch government also has initial oversight over Curacao's finances under a debt-relief arrangement. On 28 January 2013, Queen Beatrix announces that she is to abdicate in April in favour of her son. She formally stands down on 30 April, following a twentieth-century tradition of Dutch monarchs abdicating the throne in favour of a mature heir. The decision is taken as she approaches her seventy-fifth birthday, and has been widely expected. Son. m Argentinean Máxima Zorreguieta on 2 Feb 2002.